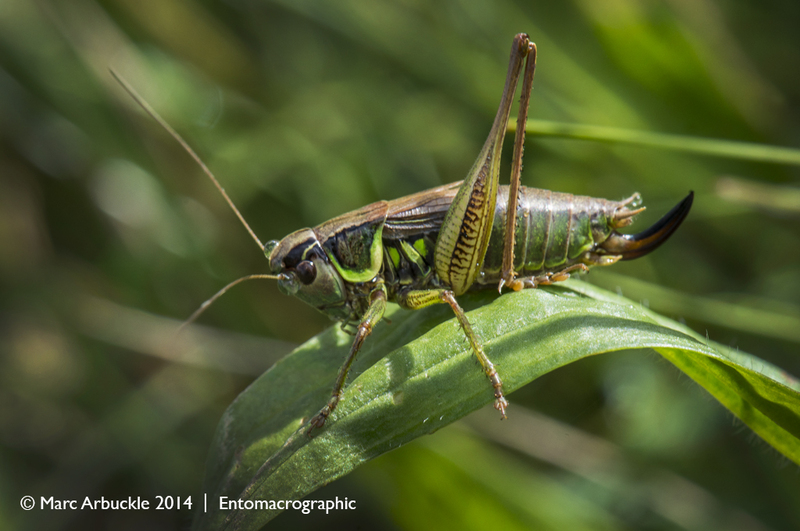 Taking macro photos of insects is as much about luck as anything. But of course you increase your luck by being out there. I was laying on Morgans Hill trying to take a photograph of a grasshopper when this little lady crawled out of the grass allowing me to get this side-on shot. It’s a female Roesel’s Bush-cricket Metrioptera roeselii. You can tell it is a female by the scythe-like ovipositor and that it is Roesel’s by the yellow/green edge to the pronotum and the three spots/patches just behind on the abdomen. Roesel’s are normally brown or yellow-brown with a hint of green and maybe a touch of red but this may be the rarer green form. This is a cricket that was rare in Britain prior to the 20th Century and pretty much only found on the South-East coast of England. Since then it has rapidly increased its range in the South, to the North and West possibly helped by the rough grassland found along the sides of many of our roads which have provided it with ‘corridors’ inland. The song is amazing I agree, probably one of the first crickets I used to catch when I was a lot younger because it is so striking. Lovely picture too! Thanks Max. Yes, she’s a very pretty cricket.